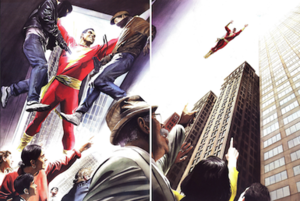 Comic book superhero Captain Marvel uses his superpowers to apprehend criminals (left) and fly over pedestrians (right) in Shazam: Power of Hope (November 2000). Art by Alex Ross. Superpower is a popular culture term for an imaginary superhuman ability. They are most frequently used in pulp magazines, comic books, science fiction, television programs, and films as the key attribute of a superhero. The concept originated in American comic books and pulp magazines of the 1930s and 1940s, and has gradually worked its way into other genres and media. There is no rigid definition of a "superpower." In popular culture, it may be used to describe anything from minimal exaggeration of normal human traits to magic, flight, super strength, projection of destructive energy beams and force fields, invulnerability, telepathy, telekinesis, teleportation, super speed, or weather control. Generally speaking, exceptional-but-not-superhuman fictional characters like Batman, Iron Man, Green Arrow, and the Punisher may be classified as superheroes even though they do not have any actual superhuman abilities. Similarly, characters with superhuman abilities derived from artificial, external sources, like the Six Million Dollar Man's bionic limbs, Green Lantern's power ring, and Tony Stark's Iron Man armor, may be described as having superpowers, but are not necessarily superhuman. In fiction, seemingly impossible superpowers are often given scientific, quasi-scientific, pseudoscientific, or supernatural explanations. Superpowers based on possible current or future technology, such as mechanized suits, rockets, bionics and genetic manipulation, are typically explained using science and science fiction. Superpowers based on psychic and paranormal phenomena, for example, are typically explained using supernatural/otherworldly ideas, parapsychology, or even pseudoscience. Other superpowers may be explained using mythology. Role-playing games often described superpowers in terms of numeric values. The 1970s brought the development of role-playing games like Dungeons & Dragons. Superhero-themed games soon followed, but within the game mechanics of role-playing game systems, issues such as the name or visible effects of a form of attack became apparent. The Champions role-playing game handled this by describing powers by their effects rather than their causes; for example, a laser and a lightning bolt were both considered to be forms of a ranged attack. Another issue was that some powers were simply more useful than others in terms of gameplay; Champions handled this as well by assigning each power a "value" in a point system, with more powerful or useful abilities costing more points to "buy." Champions also gave players options to modify their characters' powers, allowing each character's abilities to be unique. This system has influenced many other similar games since. In the 1980s, Marvel Comics began publishing their Official Handbook of the Marvel Universe series, in which the powers of their characters were explained in great detail, often using scientific and pseudo-scientific terms. Issues of persecution in relation to the possession of superpowers have also been expanded upon; an example of this is the persecution of mutants in the X-Men series. Superpowers are a commonly used concept in manga and anime, particularly in the shonen genre. They are often featured in popular manga and anime such as Attack on Titan, My Hero Academia, Hunter × Hunter, Naruto, and Code Geass. The types of powers featured vary from anime to anime. Some anime, such as Dragon Ball Z, feature many different characters who have the same types of powers; others, such as One Piece, feature characters with a wide range of different powers, with many powers being unique to only one or a few characters. ^ "RPG History Part One". ptgptb.org. Retrieved 2016-07-22. ^ "Superpowers Characters | Anime-Planet". www.anime-planet.com. Retrieved 2016-07-13. Superpower List - A growing list of user-submitted superpowers. The Physics of Superheroes, by James Kakalios- a book examining how the powers of several comic book characters would work if they were real.